Pizza is probably one of the most consumed dishes of all here in the USA. This is probably because it is relatively cheap and there are such a variety of ways to prepare it that there is bound to be a combination of crust, sauce, and topping selections to please nearly anyone. There are thin, crispy crusts for those who enjoy a New York style pie; thicker, doughier crusts for those who like the West Coast style; and even the infamous Chicago style with another layer of crust on top of the entire pie. Sauces range from pesto to ranch to creamy-garlic to marinara, while the list of possible toppings are too many to list here. I am as guilty as the rest of us of indulging in the pleasures of a good pizza. In fact, my first job was as a cook at a Rico’s Pizza and Italian Food restaurant where I had tried my hand and taste buds at a plethora of pizza styles and flavors. Since then I have moved my work from the restaurant into my kitchen (I couldn’t work at Rico’s forever you know…) and developed a recipe or two of my own that I enjoy. This past Friday kicked off the last hoorah for the kids. Yes, the last weekend before school started. My daughter was given a free ticket to a local amusement park for her scholastic achievements last year which expired at summer’s end, so we decided to use it. Food is always a rip-off in these places. One can easily expect to spend about $40 to feed 3 people barely enough to hold them off for a couple of hours. Knowing this, I consulted with the kids about homemade ideas for the day’s lunch menu and of course pizza was the big winner. Crust- I usually make my own dough for my pizzas, but this time I had some Fresh & Easy whole wheat pizza dough in the fridge and so I used that. I will however, include the dough recipe I normally use for all of you here: In a small bowl, mix 1 pack (1/4 ounce) of active dry yeast with 1 cup of warm water (120°F) and add 1 tsp sugar and 1 1/2 Tbsp of olive oil. Mix and allow to stand for 10 minutes. Now in a mixer, add 1 1/2 tsp salt to about 3 cups of bread flour (you can replace about 1/3 of the bread flour with whole wheat flour for the whole wheat version of the crust) and 3/4 cup of semolina flour and mix. Add the yeast mixture to the flour mixture and mix with a dough hook in the mixer for about 7 minutes. Cover dough and keep in a warm place to rise for at least 30 minutes. Now the dough can be rolled out on a floured surface to make your pizza crust or wrapped in plastic wrap and refrigerated or frozen. Sauce- Sometimes when in a pinch, I use jarred pasta sauce for my pizza (I like Classico). Grocers also generally have “pizza sauce” for sale, but I have yet to meet one I liked very much. 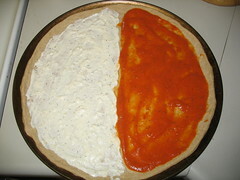 This time, for the split pizza, I made two different sauces. One was a creamy garlic sauce and the other was a marinara sauce I made from a friend’s garden tomatoes (oh wow!). Creamy Garlic: For the garlic sauce I simply added 1 Tbsp Mayonnaise to 3 Tbsp plain yogurt in a bowl, added 4 large cloves of crushed garlic, put in 1/2 tsp white vinegar, and about 1/4 tsp of salt and mixed. Marinara: The marinara sauce I had made the previous day. For this I sauteed 1 large yellow onion (diced), 2 cloves of garlic (diced), about 8 mini carrots (chopped), and about 1/4 pound of sweet peppers (chopped) for about 10 min in extra virgin olive oil. Next I added about 12 vine-ripe tomatoes of various varieties (cut into large chunks). I sauteed a few more minutes, then allowed to simmer for about an hour with 2 bay leaves, 1 Tbsp dried basil, and 1/2 Tbsp dried oregano added. When sufficiently cooked down, I removed the bay leaves and put the mix in the blender, blending until smooth. Pizza- I preheated the oven to 450°F. 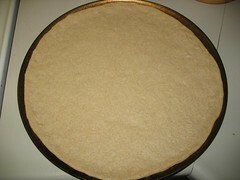 After rolling the dough out into a decent circle, I spun it into the air to get it to the desired size to fit on my pizza pan (this is great for show and admittedly fun to do!). I added marinara to one side and the creamy garlic sauce to the other. 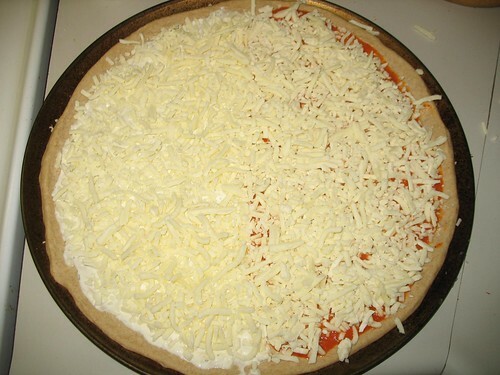 I topped the entire pie with about 1 1/2 pounds of mozzarella cheese, then added the toppings. For the chicken garlic pizza I added sauteed chicken chunks (pre-cooked until nearly done), thinly cut red onion, chopped green bell pepper, chopped green onion, and fresh tomato chunks. I then sprinkled some powdered parmesan cheese on top to finish it off. 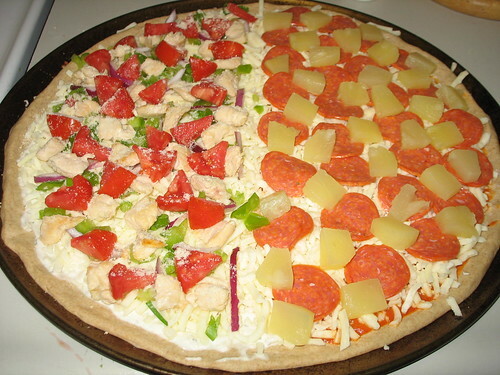 For the pepperoni-pineapple side I simply added pepperoni slices with small pineapple chunks on top. I put the pizza pan in the oven and baked it at 450°F for about 10-12 minutes and it was ready. The result was astounding! Both sides of this pizza were delicious, but the kids really raved about the chicken-garlic pieces. I have heard “that was the best pizza ever” at least a few times each day since I made this. I think the kids are not far off as this was one of the tastiest pizzas I have had in a while. Try out your version and buon appetito! This entry was posted in Breads & Baking, Cooking, Main Dish, Poultry, Recipes and tagged Chicken, chicken-garlic, chicken-garlic pizza, creamy garlic sauce, Garlic, garlic pizza, garlic sauce, Italian, marinara, Mozzarella, Onion, pepperoni, pizza, pizza crust, pizza sauce, tomato, Tomatoes. Bookmark the permalink. OMG . 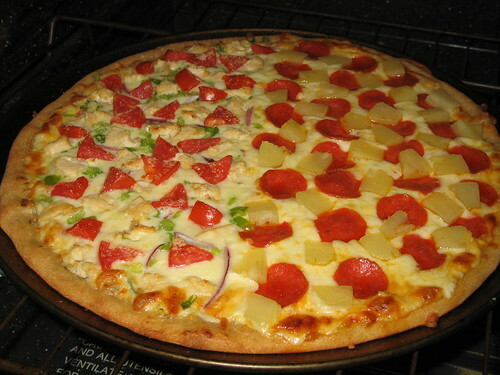 Lovely Pizza, I love Pizza so much , I will definitely try the garlic chicken. yummyyyyyyy…..i can tell it is delicious and it will be one of the thing to be on the list for my visit :-taste clint special pizza :D:D…..you go chef !!!! Looks like the list is growing! 😉 If you come and visit, we will treat you right for sure! Sure kat, your boyfriend will probably love it and it goes well with bacon too 😉 Viviane, you got it! Just pick your toppings and I’ll whip you up a great pie! You owe me one when I am there!